INDIANAPOLIS, IND. 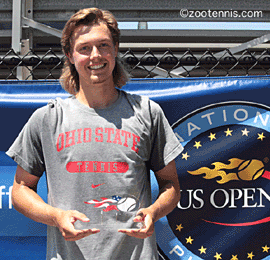 --- The US Open National Playoffs Midwest Sectional Qualifying Tournament came to a close late Monday at the tennis courts of the University of Notre Dame in South Bend, Ind. Champions were crowned in all divisions: Men’s Singles, Women’s Singles, Men’s Doubles, Women’s Doubles, and Mixed Doubles. 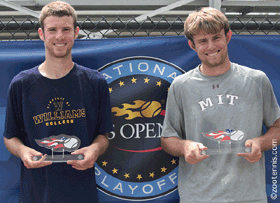 All winners advanced to the 2016 US Open National Playoffs and a chance to play in the US Open. The tournament featured some of the Midwest’s top players, with a mix of college players – including two from Notre Dame - local players, and top-level juniors. The men’s final featured two college players who have competed against each other since they were young boys, and the Men’s Doubles paired incoming Notre Dame teammates against two brothers. The women’s matches were just as competitive, with last year’s single’s winner facing off against the 2014 winner. 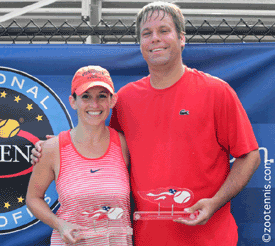 The Mixed Doubles competition included a local South Bend couple, taking on the Men’s Singles champion and his partner, the Women’s Doubles champion. Following is a summary of the results. The No. 1 seed, and last year’s winner, Martin Joyce, was victorious again, defeating the No. 5 seed Eddie Grabill, 3-6; 6-2; 6-4. The two men are both from Hinsdale, Ill., and grew up playing against each other. Joyce was excited about the win, acknowledging how challenging the match was. “Obviously winning feels really good. This year was tougher than last year too being that he’s a really good player. We’ve played a lot in the past, and this one [match] was a good one too,” Joyce said. Joyce returned to the tournament because he enjoys the excitement of being a part of the US Open and experiencing Chair Umpires and Line Judges, which are not part of most tournaments. “It’s just a really cool event, especially being a part of the US Open,” he said. Although he fell to his long-time rival, Grabill was pleased with reaching the finals. “I was really happy I was able to reach the finals. Coming here I was the 5 seed so I didn’t have much expectation of making a run in this tournament, so getting here was definitely an accomplishment,” he said. Last year’s champion, Sara Daavettila from Williamston, Mich. (headed to the University of North Carolina) successfully defended her title, defeating the 2014 champion Denise Muresan (Lincolnshire, Ill.) 6-1; 6-2. 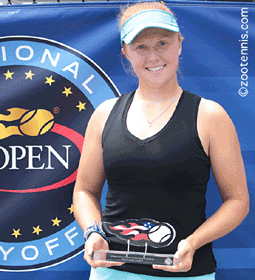 “To have a chance to go to the US Open, and to represent the Section (USTA/Midwest), is amazing” Daavettila said. “They run this tournament so well, and I feel like family; it’s one of my favorite tournaments by far,” she said. Her opponent, who left the women’s pro circuit just a little over a year ago, was happy to be competing again and was pleased with reaching the finals. Austin and Tyler Barr, brothers from Chagrin Falls, Ohio, captured the doubles title, defeating the duo of Daniel Rayl and Johnathan Small, 6-2; 6-4. Tyler, who plays for MIT, is happy that the years of doubles practice with his brother and father have paid off. They decided to bring their experience to the tournament after seeing the great competition that would be participating. “We saw there would be a lot of great players, and we definitely wanted to get in on the great competition,” Tyler said. The duo of Rayl and Small represented their home state of Indiana, and the University of Notre Dame, quite well. The two have been teammates before, growing up close to each other, and are looking forward to playing together in college. Rayl just completed his freshman year and Small will be joining the team next fall. 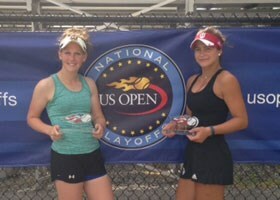 Tracy Kuhle (Decatur, Ill.) and Danielle Wolf (Cincinnati, Ohio/Indiana University) defeated Christina and Katie Zordani, sisters from Lake Forest, Ill. for the Women’s Doubles title. It was a tough match, going three sets with Kuhle and Wolf coming out on top 6-2; 2-6; 1-0(5). The team is now looking ahead to the next round. “I’m really excited! I didn’t really expect this, but I’m excited about going on to play in Connecticut,” said Kuhle. The couple was excited yet surprised about the win, Caroline even saying “It’s a miracle!” Although they both play tennis it has been quite some time since they had played together competitively. 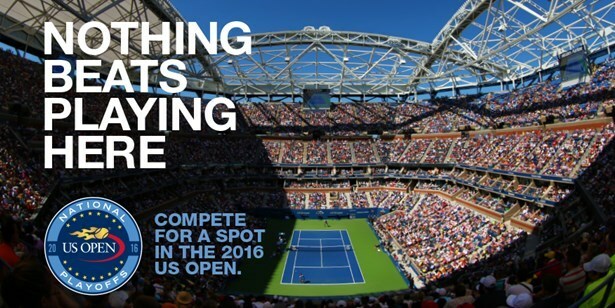 The US Open Qualifying Tournament will be held Aug. 23-26, the US Open men’s and women’s doubles championships begin Aug. 30 and the US Open mixed doubles championship begins Aug. 31 at the USTA Billie Jean King National Tennis Center in Flushing, N.Y. The 2016 US Open is scheduled to take place from Aug. 29 to Sept. 11.